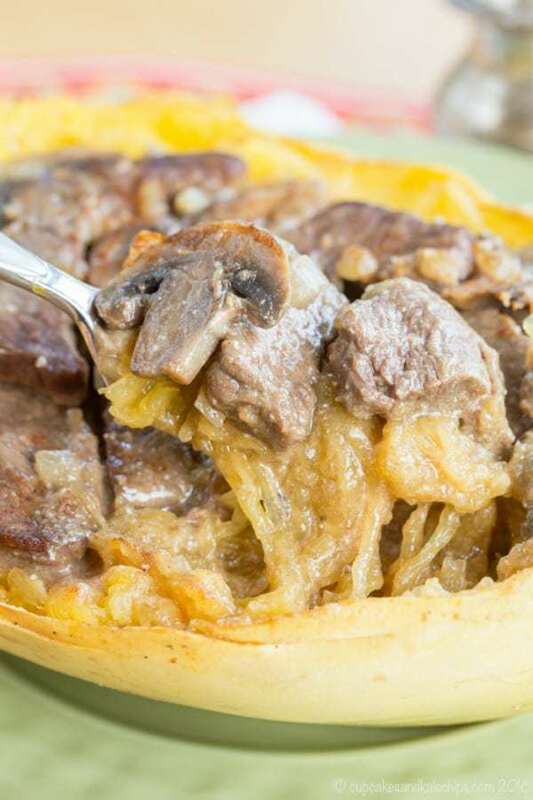 Lighten up the classic recipe and make it gluten free and low carb too, by using lean beef and Greek yogurt, and serving it in spaghetti squash boats. #SundaySupper is here with the Beef Checkoff to share recipes which will inspire you to Live a Flavorful Life in 2016, and to incorporate beef into healthy, balanced meals full of your favorite flavors and ingredients. 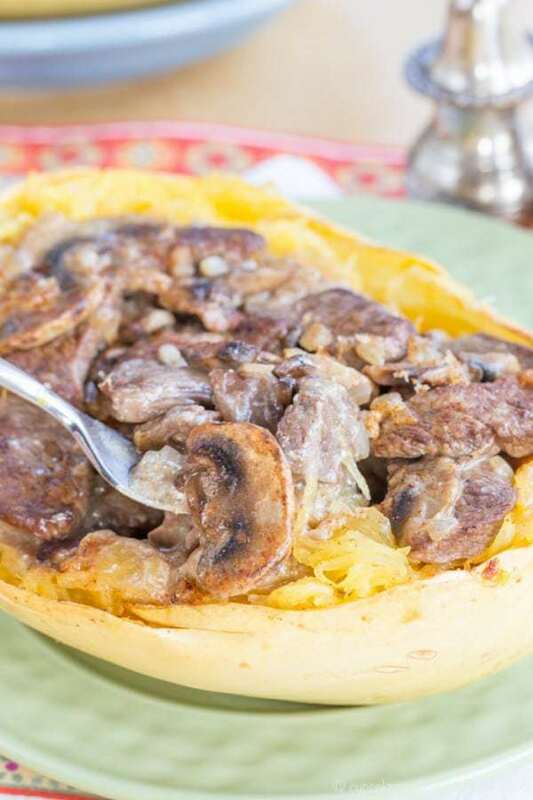 I’m bringing back a dish from my childhood, making it healthy and gluten free, but still with all of the rich, creamy goodness, with this Skinny Beef Stroganoff Stuffed Spaghetti Squash recipe. It still amazes me how tastes change how you get older. Even aromas that once made you want to turn up your nose grow to evoke feelings of nostalgia. And one of the most interesting and fun and satisfying aspects of being a recipe developer and food blogger is being inspired to revisit childhood memories, then transforming foods that as a kid you didn’t even want to touch into new family favorites. I also happen to love using the opportunity to take things I have learned to incorporate fresher ingredients and make them maybe just a bit healthier. When I was a little girl, my mom’s go-to was the classic Betty Crocker Cookbook. That thing is tattered and torn and dog-eared because it was her reference for so many recipes she made. On evenings when I’d detect the familiar scent of Beef Stroganoff in the air and saw the bag of egg noodles being poured into a pot, though, I wanted to be invited to a friend’s house for dinner instead of being subjected to that dish. As a kid, unless they were breaded and deep fried, I loathed mushrooms. You could give me spaghetti or mac and cheese, but I really wasn’t a fan of egg noodles. And that tangy, creamy sauce was not pleasing to this picky little girl. Naturally it was one of her favorites. As I got older, I conveniently forgot about this dreaded dish. However, something made me want to try it again. I got the original recipe, made some tweaks, and as I lifted the lid from the simmering sauce, it was no longer feelings of disgust. It was now a culinary time machine. I was immediately transported back to that little kitchen that was so familiar. The one where I ate most of my meals the first thirteen years of my life. Where even during our hardest times, my mom and I alone, her trying to juggle teaching and coaching and advising while making sure I got to and from school and after school activities myself, she always made sure I had a hot, satisfying dinner. As far as nutritious, well, given what she knew, had access to, and could afford, as well as what my persnickety palate was willing to eat, she did her best. And as I now cook for my family, I am appreciative not only for her time and effort, but also for giving me the basic cooking skills I needed in order to be able to do the same for my family. 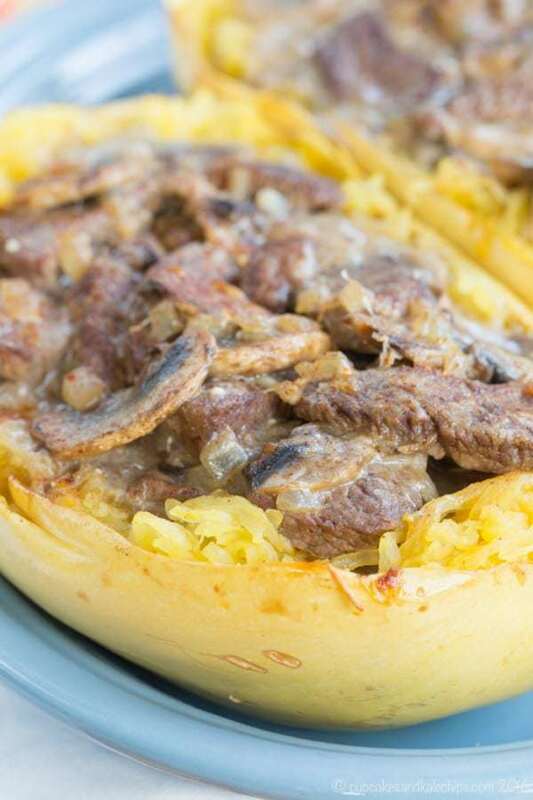 My Skinny Beef Stroganoff Stuffed Spaghetti Squash recipe has ignited in me a newfound love for this classic dish. 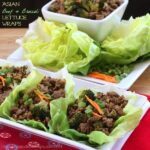 It is so full of flavor with plenty of meaty texture from both the beef and the abundance of mushrooms. The sauce is thick and velvety without being heavy, and it soaks in and coats the spaghetti squash for a creamy and comforting meal. I also love the toasty topping of just a sprinkle of parmesan cheese that you don’t get when you serve traditional beef stroganoff out of the pan on top of noodles. How did I lighten it up without sacrificing any of the flavor and texture you expect? I reduced the butter and replaced half of it with olive oil to have a higher ratio of those unsaturated fats. Instead of the usual egg noodles, I opted for my favorite veggie noodle, the spaghetti squash, to amp up the produce factor. If you don’t have a gluten allergy or just want to work in some whole grains, you can dunk whole grain bread in that delicious sauce or serve the squash and stroganoff mixture over some whole wheat or quinoa pasta, as I did for my boys, who aren’t the biggest spaghetti squash fans in the world. And the creaminess you crave is still there, but without the additional fat and calories, from swapping the usual sour cream with low fat or non fat Greek yogurt. But one of the most important things I did to transform this traditionally rich, heavy meal was to ensure I used one of the lean cuts of beef, a Top Sirloin Steak. 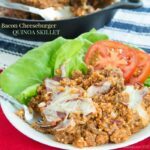 I am so happy to be partnering with the Beef Checkoff, along with the other members of the #SundaySupper family, to show you many ways that you can incorporate beef into a delicious and nutritious balanced diet. Beef not only brings such great flavors to your family meals, but by choosing one of the lean cuts, which you can find by selecting one of the options with the green lean icon from the Interactive Butcher Counter, you are also adding a protein-rich and wholesome choice to your dinner table. You’ll also find tips and recipes for preparing each of these cuts in way to help you live a flavorful life. You can also get more information and inspiration from the Beef Checkoff by following them on Twitter, Facebook, Pinterest, and YouTube. 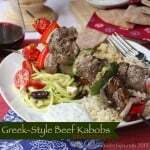 Then check out more recipes on the Healthy Meals with Beef Pinterest board all of the #SundaySupper recipes at the bottom of this post. Cut you spaghetti squash in half and scoop out the seeds with a spoon. Bake cut side down on a baking sheet for 45 minutes-1 hour or until tender. Alternatively, you can microwave for 8-10 minutes. Using two forks, scrape the "noodles" out of the spaghetti squash and set the shells aside for later. Place the squash noodles in a paper towel-lined colander to drain the excess moisture. Meanwhile, melt butter in a large pan. Add the mushrooms, onion, and garlic, and cook till tender, then remove from the pan and set aside. Heat the olive oil in the same pan and add the beef, and cook until browned on all sides. Add 1 cup of the broth, salt, and Worcestershire sauce to the beef in the pan. Bring to a boil, cover, reduct heat and simmer for 15 minutes. Whisk together the remaining half cup of broth and cornstarch. Stir the slurry into the beef mixture in the pan, add back the mushroom mixture, and bring to a boil. Let boil for 1-2 minutes, or until thickened. Place the squash shells in a baking dish. Divide the squash noodles between the shells and make a well in the center. Divide the beef mixture between the shells and sprinkle with parmesan cheese. Bake at 400°F for 10-12 minutes, or until heated through and golden brown. 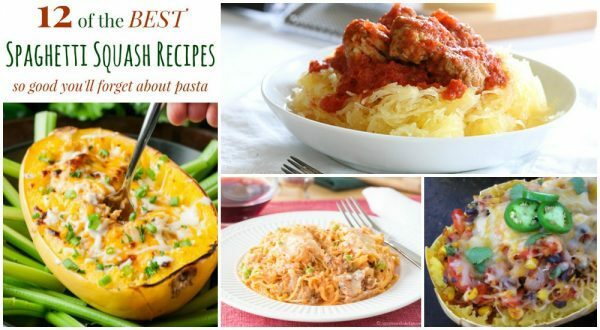 Make sure you check out 12 of the Best Spaghetti Squash Recipes So Good You’ll Forget About Pasta! This was delicious! not a fan of spaghetti squash but making some life style changes. Kept going back for more bites. Also I don’t know if you wanted me to feel like a serious pintrest success but your food looks great, however, with the Parmesan crust on the top of mine it was even more the show stopper. Thanks for boosting up my dinner game. Thank you so much for the compliment, and I’m so happy that you enjoyed the spaghetti squash, Tami! I made this, but with ground beef. It was amazing! A great recipe to use up my bounty of spaghetti squash! My husband usually turns up his nose at squash, but he loved it too! Thanks for the awesome recipe! SO glad to hear that your family enjoyed the skinny stroganoff spaghetti squash, Sarah. Thanks for coming back to let us know! I’ve always wanted to try spaghetti squash but having it with just tomato sauce never looked appealing. I love beef stroganoff and this recipe is perfect – healthy and totally what is going to make me try that squash! I love spaghetti squash, but I also enjoy finding different ways to make it! Oh, wow, this looks delicious! I can’t wait to try it – I haven’t had beef stroganoff! It’s really good! I hope you try it! Oh my gosh! This looks great! I love anything loaded with mushrooms! I am such a mushroom fan! I take all the ones the rest of ym family won’t eat! 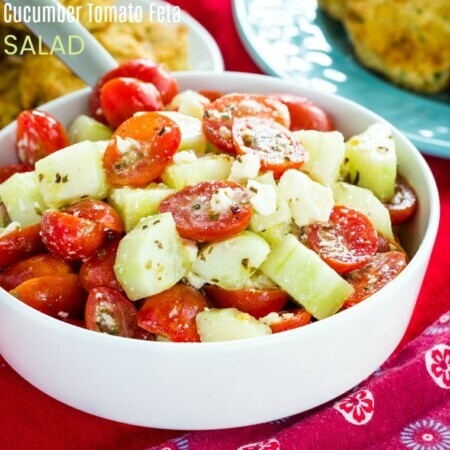 This sounds so yummy… and I happen to have a spaghetti squash in my fridge! We’ll be trying this soon. Thank you for sharing a “different” spaghetti squash recipe than the typical red sauce, meat and cheese! I get tired of eating spaghetti squash that way too! I had to change it up! You took two of my faves and smooshed them together. I love you!!!! Such a great idea for incorporating spag squash into the menu! 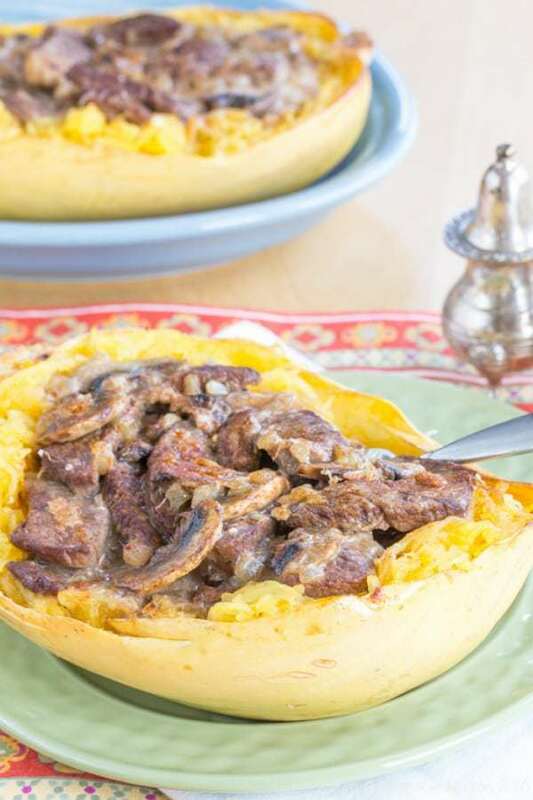 I love the idea of using spaghetti squash to lighten up stroganoff. Brilliant! I need to make stroganoff soon. This one looks perfect for dinner next week. Looks wonderful Brianne! And it may just be the recipe that would get my husband to eat spaghetti squash. I know that Betty Crocker Cookbook very well! I love how you transformed this classic into a much lighter version. 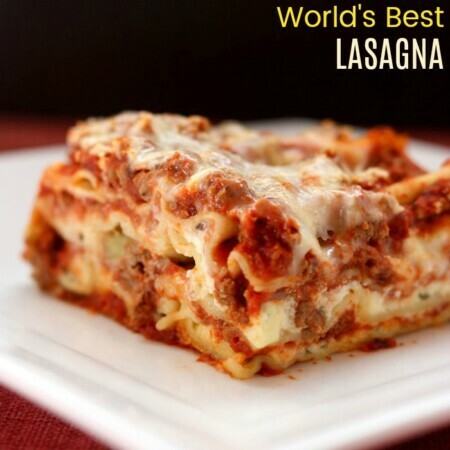 Great idea to use spaghetti squash instad of noodles to lighten up this classic dish! A great way to use spaghetti squash! Yum! Oh heck yesssss! 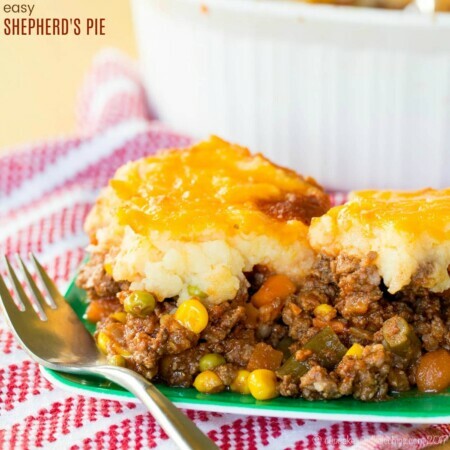 Lightened up comfort food like this is my kind of meal! Your skinny version looks divine! I need to make stroganoff using sirloin instead of ground beef—a delicious step up! You know, I saw the ground beef recipes and my mom actually always made it with sliced steak so I was surprised to see the ground beef versions. I love that your recipe was evoked by family memories. I also love how you reinvented it. 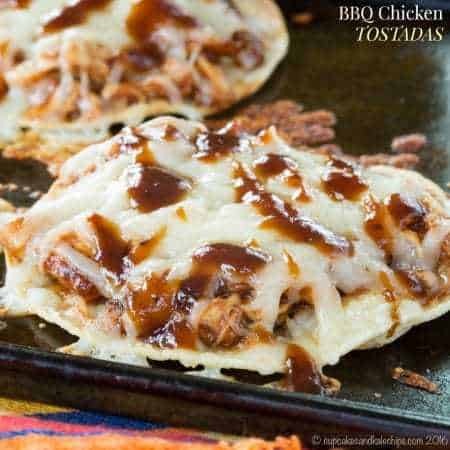 I am definitely going to try this recipe out for Grumpy and me, it is one he can totally eat and it looks yummy! I think you will both enjoy it!